Tellurium is a chemical element. It has the chemical symbol Te and the atomic number 52. It has 52 protons and 52 electrons. Its mass number is 127.6. It has 8 natural isotopes. 4 are stable and 4 are radioactive. One of the radioactive ones lasts longer than any other isotope. It has a half life of 2.2 x 1024 years (2 years). It is a brittle silver-white semimetal. When it is pure it has a metallic shine. It is ground easily. It can be made in an amorphous form. It is a semiconductor. It changes conductivity a little when light shines on it, similar to selenium. It is corrosive to many metals when molten. Tellurium is an unreactive element. It can react with reactive metals to make tellurides. It can burn in air to make tellurium dioxide. It can be oxidized even more to tellurium trioxide. It does not corrode. The chemistry of tellurium is similar to some chemistry of selenium and sulfur, although its compounds are more reactive and the element is less reactive. It does not dissolve in most acids, although it dissolves in concentrated sulfuric acid to make a special red tellurium cation. Tellurium makes chemical compounds in several oxidation states: -2, +2, +4, and +6. -2 compounds are normally found in tellurides. They are strong reducing agents. Tellurides are normally the main ore of tellurium. Most natural tellurides are not pure, so they are much less reactive. +2 compounds are found in some tellurium halides, like tellurium(II) chloride and tellurium(II) bromide. They are the rarest oxidation state. +4 compounds are found in tellurites and tellurous acid. They are weak oxidizing agents, that can be reduced to tellurium. Tellurites are made by reacting tellurium dioxide with a metal oxide. +6 compounds are found in tellurates and telluric acid. They are powerful oxidizing agents. Tellurates are made by reacting telluric acid with metal oxides. Tellurium is a very rare mineral. There is 14 times more silver in the earth than there is tellurium. Tellurium is sometimes found as an element, but most of the times is found as tellurides. Gold tellurides (Calaverite) are found in the earth. They are valuable ores of both tellurium and gold. This gold ore was not recognized as gold during one gold rush and was used as a filler. It was then discovered that it was gold telluride, making another gold rush. Telluride cannot replace sulfide in elements like selenide does. Tellurium can be taken from gold telluride by dissolving the gold telluride in concentrated sulfuric acid. The tellurium dissolves to make a red solution, while the gold sinks to the bottom. A more common way of extracting tellurium from tellurides is to heat the tellurides. The tellurides are heated with sodium carbonate and air. This makes sodium tellurite. 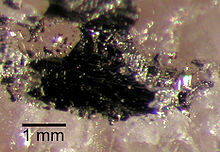 Selenites are normally found as an impurity. They are separated by reacting them with sulfuric acid. The selenites stay in solution. The tellurites turn into tellurium dioxide. Then the tellurium dioxide is reacted with sulfur dioxide dissolved in sulfuric acid to make tellurium metal. The tellurium can be melted and reformed to make bars of tellurium metal. The main use of tellurium is in alloys. It is used in iron, copper, and lead alloys. It makes the metals more easily machinable (able to be shaped by a machine). It improves strength and durability of lead and makes it more resistant to corrosion by sulfuric acid. Tellurium is also used in cadmium telluride solar cells. These are very efficient. It can be alloyed with both cadmium and mercury to make mercury cadmium telluride, an infrared sensitive semiconductor. It is used in some rewritable (able to be erased and written again) optical discs. Lead telluride is used in another type of infrared sensor. It is also used to color ceramics. It is used to make fiberglass that is used in telecommunications (telephones, internet, etc.). It helps increase the refraction. It is also used in delay blasting caps. Rubber can be ha. Tellurium is not really used in any living things. Some fungi, though, can use tellurium instead of selenium or sulfur. Most organisms can metabolize tellurium to make dimethyl telluride, which is a garlic-smelling chemical. If someone eats a tellurium compound, it gives them garlic breath. This page was last changed on 31 July 2018, at 04:47.